The project this week has been one of birds once again. I found an old redwood table out for the trash pickup a few months back. Being the ‘repurposer’ that I am, I had Dan run down and throw it in the back of his truck. We used the legs of the table on our dining room table ( it is the old door from my art studio) with glass over it. And now we are using the slates from the table to construct frames. I dropped a piece of glass in the frame and mosaic my creations right on top. I’ve used glass tile and a welbond adhesive. 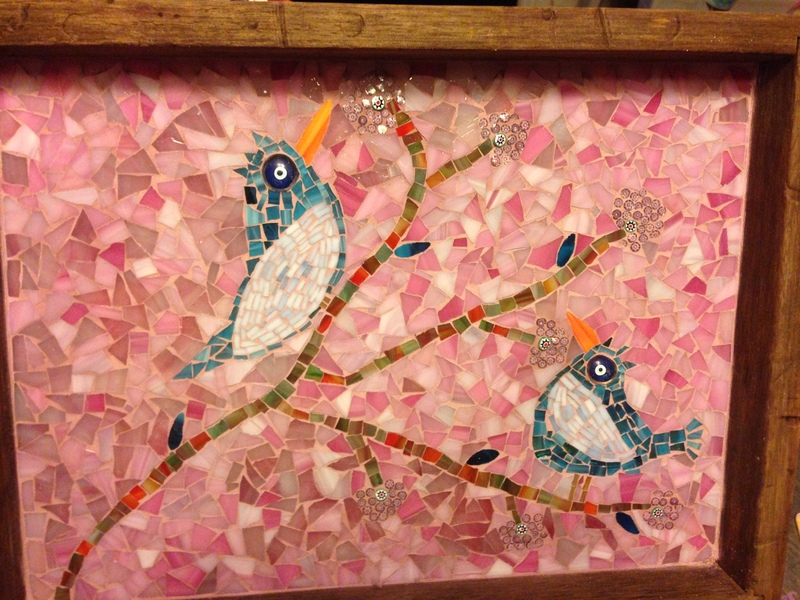 I had fun using a pinkish grout, one that I’ve never used before. I’m into doing birds now with some crazy eyes….it makes me smile. Let me know what you think. My next project already started….. the old beach window scene, for my relatives who gave me some windows from their house.